여주이씨 옥산문중에는 회재 이언적(晦齋 李彦迪, 1491-1553)을 비롯하여 이 가문의 세대별 고문서가 잘 보전되어 있다. 이들 문서는 16～20세기 초까지 그 어느 문중보다 수량이 많고 종류가 다양하며 내용도 풍부하여 귀중한 자료이다. 지정대상은 시기를 선조 이전의 문서로 한정하여 교서(敎書) 1점, 유지(有旨) 7점, 교지·첩(敎旨·牒) 20점, 급첩(給牒) 1점, 상소초(上疏草) 2점, 첩(帖) 1점, 입안(立案) 12점, 소지류(所志類) 7점, 분재기류(分財記類) 14점, 노비문기(奴婢文記) 18점, 토지문기(土地文記) 14점, 간찰(簡札) 1점 등 총 98건이다. 내용은 이언적의 관력(官歷)과 관련된 부분으로 특히 이언적의 학문적 위상을 고려하여 작성된 有旨를 비롯하여 세자시강원의 좌우부빈객을 역임할 당시 맺었던 친분으로 보낸 답장의 글인 인종수찰(仁宗手札)이 있다. 특히 납속(納贖)을 통해 신분적인 제약에서 벗어나는 허통급첩(許通給牒)은 신분사연구 자료로서 가치가 높으며, 노비문기 가운데 입안 절차를 밟아 입안을 받은 일괄문서가 16건이나 된다. 이들 옥산문중 고문서는 조선시대 신분사 및 사회·경제사연구에 중요한 자료이다. These well-preserved documents from different generations of the Oksan Branch of the Yeoju Yi Clan, including Hoejae Yi Eonjeok (1491-15530, span the 16th century to the early 20th century. The clan possesses a greater number of such documents, which are notable for their diversity and richness of content, than any other family clan. The ninety-eight designated documents, which predate the reign of King Seonjo, comprise one Government Paper, seven Royal Edicts, twenty Books of Royal Notices of Appointment, one Book of wage records, two Civil Petitions to the King, one Album of collected documents, twelve Official Certification Notices, seven Legal Papers, fourteen Testaments of division of assets, eighteen Documents regarding the sale of slaves, fourteen Documents regarding sale of land, and one Personal Letter. 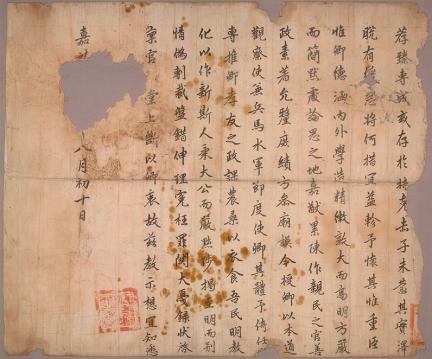 Notably, the contents include a royal edict that describes the scholarly achievements and official career of Yi Eon-jeok, and a letter written by King Injong, whom Yi befriended while he was serving as a high official in the Sejasigangwon, an institute dedicated to the education of the crown prince of Joseon. The Heotonggeupcheop illustrates that it was possible for a person to break away from class restrictions, making it a valuable material for studies of the history of class and rank in Joseon, while sixteen of the documents regarding slaves carry official certification of their sale or transfer, providing a valuable record of transactions involving slaves. These old documents belonging to the Oksan Branch of the Yeoju Yi Clan are particularly valuable materials for the study of Joseon’s class-based society as well as society and economics.